The greatest thing my mother ever did for me was something she didn’t do. She never, ever, talked about dieting, being skinny, or working out. Ever. At least, not to me and not that I heard about, and that’s good enough. She was active, in that she was always doing something. She worked long hours on her feet, she played softball and bowled on a ladies’ league, and she enjoyed yard work (our yard in Cornwall was not an easy mow). Averaged out over time, she swam far more laps than anyone else in our family because she loved being in the pool. And then she got out of the pool and ate two egg salad sandwiches. On white bread. With a metric ton of Miracle Whip. But she never, ever pushed me to be a certain size or be an athlete (she lettered in basketball in high school), or to make my hair do what other girls’ hair did. I was a dancer instead, and that was me pushing myself and Mom braiding my hair for recitals. I didn’t always believe her — I was a teenager for a while, after all. But I always knew that I looked like me, and “me” was exactly who I was supposed to look like. I didn’t understand the value of this until much later, when I found out how much pressure mothers can put on their daughters (and sometimes their sons, but mostly their daughters) to meet society’s beauty standards. I didn’t know how common that was because it wasn’t my experience, and I didn’t know until I was in junior high that the size of my…anything mattered to anyone. Because of this, I’ve never been comfortable with dieting and working toward a particular size or weight — the numbers don’t have any intrinsic value for me (and I get REALLY testy when I see young adult lit harping on the “perfect” size — I’m looking at you, Sweet Valley High). When you hear about me running or cross-training or having smoothies for breakfast every damn day, it’s because I feel crappy and running makes me feel better (yay, endorphins!) and smoothies are tasty, tasty treats that don’t make my belly hurt in the morning. It’s not in preparation for swimsuit season. That’s just not how I was raised. I do know that it’s a compliment when someone notices and remarks on weight loss, and I try to take it as such. I don’t know it instinctively, because my mom never connected any dots between body size, effort to control body size, and personal worth. 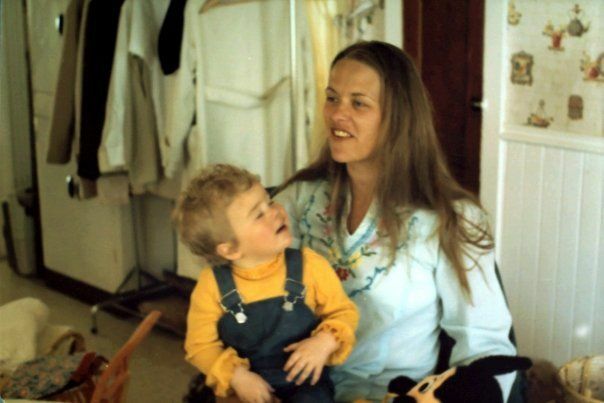 For that, I’m more grateful than for anything else Mom did…or didn’t do. Kudos to your mom. My mom wasn’t always weight obsessed and even now, she tends to not be overly obsessed about food and weight. I think she eats when she’s hungry and that’s that, but I do remember a period of time where she went through this whole weight loss craze (I’m sure it’s common after having kids, because I know I’m there right now), and I remember her saying things to me when I ate crap food like “Once on the lips, twice on the hips.” Which is a pretty rotten thing to say to a teenager. And then people wonder why I have body issues. I know it’s possible that she went through a weight loss phase or craze before my time, but it never came out on me, so…win-win. I remember thinking your mom was SO GORGEOUS and I wanted to look just like her, thin and blonde and pretty. And I remember thinking my best friend Daren was the prettiest girl I knew, and I would have killed to look like her, with beautiful curly red hair and a body that was naturally prone to athleticism, thin and curvy in all the right places. But more than that, I remember Mum saying how pretty she thought I was, and how much she thinks I look like Memere–which I take as a high compliment. She’s always stressed the importance of being healthy, but when I showed up to surprise her after losing about twenty pounds after three months in Philly, she went out of her way to remind me that “thin” doesn’t equal “healthy,” and she was right, as always. It’s so important to have a good female role model, and I had numerous ones: strong, independently minded women who look how they want to look and look gorgeous because of it, and who continue to inspire me everyday. You’re one of ’em, P.S. Awww. You’re so sweet to say that, Boo. If I’m a role model for you, then I am very, very proud. Your pop mentioned at Mom’s service that I look “so much like Jeanne, even the eyebrows.” I told him I actually have Dad’s eyebrow…and tweezers. KidBrother and I got a bizarrely even mix of features from each side and they come out at random. I’ve been surrounded my whole life by women of every size who are so beautiful it’ll make you cry. Occasionally, I’ve met someone so ugly on the inside that the body of a model couldn’t outweigh that. With that kind of evidence, it’s hard to put a lot of stock in society’s standards.